Another Collage – LOVE THIS ONE! When we went to Florida last fall, we visited St. Joe Peninsula State Park and happened on this lovely scene I caught with my camera. Thank heavens for long lenses! 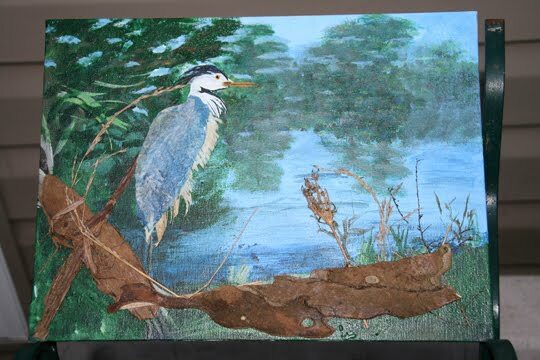 I used a lot of natural materials for this, including corn husk for the feathers, blue recycled wax paper that I’d done some leaf print work with, and of course twigs, grasses and tree bark. Golden mat gel and voila! 1 Response to Another Collage – LOVE THIS ONE! >This is just a wonderful work. I have been reading your blog and am truly impressed.